The spectre of sustainability has been haunting the guitar world of late. Manufacturers are finding it increasingly difficult to legally source rare tone woods, while the CITES and Lacey acts make it potentially illegal to resell vintage guitars made from endangered species without proper documentation, to transport them across international borders, or even display them in public. German police have recently confiscated vintage guitars that were advertised online and the likely fate for these instruments is to be destroyed. Gulp! Sustainability has also been on the minds of the Carolan team. One motivation for having a guitar tell its own story is to provide documentation of how it was made, an example of the ‘guitar passport’ that may be required in the future. In Carolan’s case, we have documented how it has been constructed from flamed maple, Indian rosewood and reclaimed mahogany as part of its provenance. Our concerns with sustainability go beyond the choice of woods however. We have also been bothered by the question of how to attach digital media to a traditional wooden guitar in a sustainable way. Emerging digital technologies and traditional wooden technologies evolve at quite different rates. Valuable wooden objects live for decades and change slowly (although they do change as parts get replaced), while digital devices and media formats appear to evolve far more rapidly rapidly, lasting for just a few years before they are superseded by the latest must-have gadget or social media service. How can we manage the problem that the digital part of Carolan – it’s digital footprint – may become obsolete long before its wooden body has reached the end of its useful life? This turns out to be a complex question. First, it is not clear whether digital media do become obsolete in quite this way. Indeed, there is a quite different school of thought that argues that the real-problem with digital media is that they are never truly deleted; that our digital memories never fade from view, even if we wish them to. This position has been powerfully argued by Viktor Mayer-Schönberger in his book ‘Delete: The Virtue of Forgetting in the Digital Age‘ and underpins recent and controversial European legislation that legally enshrines the right to be forgotten. So one challenge for Carolan is to decide what it should remember in the first place. Should Carolan permanently document every person that it meets and every place that it goes, or should its recording be a curated and voluntary process? Should we add greater automation to Carolan – perhaps some sensors – or should its curation remain a manual task as it is today? A second major challenge for Carolan then lies in maintaining the connections between its physical and digital materials. Even if its chosen digital memories persist somewhere, changes in smartphone and tablet technologies and perhaps even the decline of our beloved Aestheticode technology into obscurity – god forbid – may make it impossible to scan the guitar in the future. After all, aren’t we all familiar with the challenges of retaining access to our own digital photos, videos and music collections whenever we update our computing devices? At the very least, it also seems to involve significant and often frustrating work installing new software upgrades and possibly even converting file formats. Carolan can’t easily duck this problem, but it is interesting to compare our approach of scanning surface decorations with the alternative of directly embedding electronics (e.g., sensors or miniature web servers) into the instrument itself. Depending on exactly how this was achieved, upgrading electronics might have required surgery to the guitar itself (as removing an embedded pick-up or tuner might). Or maybe we could have devised an easily removable electronics pack that could be velcroed in, but even then changing the link to the digital footprint would have required a hardware rather than a software upgrade. 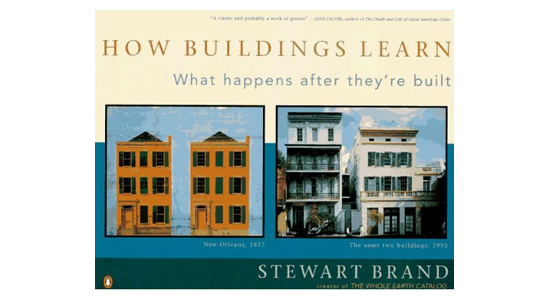 This conundrum reminds us of the architect Stuart Brand’s book ‘How Buildings Learn’ in which he charted the significant evolution of buildings – things that we naturally expect to evolve slowly – over long periods of time. 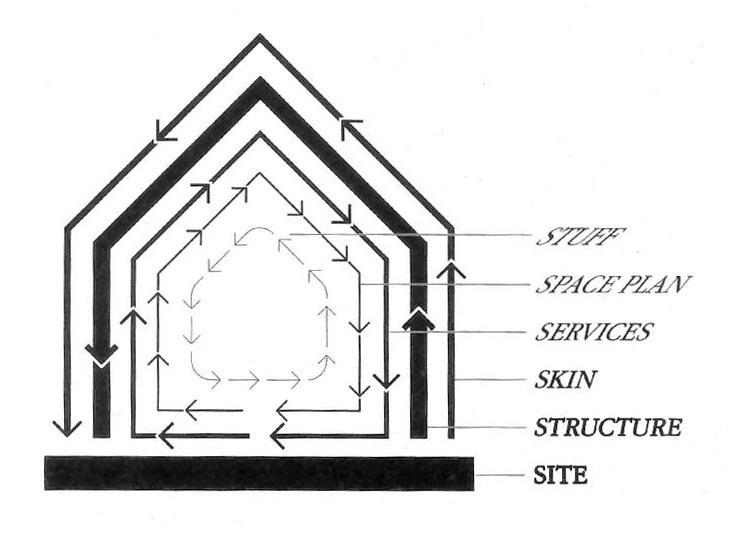 Brand argued that the evolution of buildings can be considered in terms of six layers – each conveniently beginning with the letter S – that evolve at different rates: site, structure, services, skin, space plan and stuff. As a building evolves so these layers shear against one another, causing frictions or tensions where they are closely connected. It is painful to have to change the structure of a building in order to upgrade a service, or have to change a service just to bring new ephemeral stuff into the home. Our own previous work at the Mixed reality Lab has built on Brand’s idea to consider the tensions inherent in embedding digital technologies into homes and other buildings . Imagine, for example, how buying a new tablet (stuff) might then require upgrading your WiFi (services) which in turn involves rearranging your furniture to find the best position for the new router (space plan) or even having to lay new cables under the floor boards or behind the plaster (skin). The same reasoning might be applied to Carolan. The digital and physical aspects of Carolan can be thought of as being different layers. Perhaps the digital is even a new seventh ‘S’, that of Stories? Might similar kinds of shearing tensions arise over our guitar’s lifetime if these layers are too tightly coupled? Will there be consequences for maintenance and even obsolescence if digital and physical layers are too closely coupled to one another, for example if digital electronics are deeply embedded into the wooden structure? Could a more superficial coupling through scannable surface decorations be less susceptible to such tensions? This has been one of our motivations for exploring the approach of interactive surface decoration – to create a more lightweight coupling between physical and digital where digital technologies (phones, tablets, scanning software etc) can be updated without touching the guitar itself. However, only time will tell if this is really a more sustainable strategy. Perhaps new and unexpected shearing tensions will be revealed. Before we close, we’ll quickly raise one further facet of sustainability. A core aim of the Carolan project is to increase the value of a physical artifact by associating it with a growing digital history. This idea has been previously explored within the Tales of Things and Electronic Memory (TOTeM) project that experimented with adding digital stories to second hand goods in Oxfam shops. Our hope is that Carolan will become more valuable over time – if only to us – as it gathers more and more stories. We anticipate that this will provide an example of how associating digital footprints with artefacts might lead to second-hand goods becoming more valuable than new ones and so promote the recycling, or more accurately the ‘up cycling’, of goods. Or maybe we will have to cut down all of the remaining tonewood trees to fuel the generators to power the servers that will store all of these digital memories. Hmmm, this sustainability business is confusing. Probably time to switch our brains off before they hurt anymore and get back to playing some tunes ….